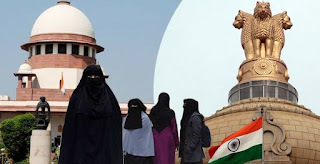 Supreme Court by a majority verdict on 22nd August ruled that the practice of divorce through triple talaq among Muslims is "void", "illegal" and "unconstitutional". The SC also suspended the practice of instant triple talaq for 6 months. The verdict vindicates the stand of the government, which had said triple talaq violates fundamental rights of women. Several Muslim women who have been divorced because of it, including on Skype and on WhatsApp, had appealed to the top court to end the practice. The apex court by 3:2 verdict held that the triple talaq is against the basic tenets of Quran. While Chief Justice J S Khehar and Justice S Abdul Nazeer were in favour of putting on hold for six months the practice of triple talaq, asking the government to come out with a law in this regard, Justices Kurian Joseph, R F Nariman and U U Lalit held it as violative of the Constitution and must be struck down. The SC asked the govt to come out with legislation on triple talaq and hoped that the Centre's legislation will take into account concerns of Muslim bodies and Sharia law.